New Delhi: Union Agriculture and Farmers Welfare Minister, Radha Mohan Singh said only through cross-pollination of expertise and innovations and thereafter synergy during implementation of the programs conceived we would be able to achieve the goal set for the country by Prime Minister, through his farsightedness, of doubling farmers’ income by 2022. Singh said it on Thursday during National Summit on Smart Agriculture Marketing Solutions to Double the Farmers Income organised in Federation of Indian Chambers of Commerce and Industry FICCI. The representative from Rajasthan, Haryana, Assam, Goa, Maharashtra, Andhra Pradesh, Telangana and Bihar were also participated in the conference. 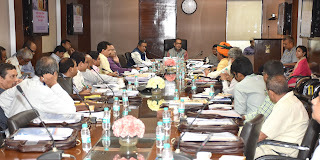 Radha Mohan Singh said as per the Third Advance Estimates food grain production in the country has increased to 273 MT in 2016-17, oil seeds to 32.5 MT, and sugarcane to 306 MT. Fruits & Vegetable production has increased to 287 MTs, according to the Second Advance Estimate. He said that there has been a record production of food grains in 2016-17 and all previous records were broken. Singh said farmers have not been getting the corresponding increase in remuneration. The Government is seized of the urgent requirement of strengthening market systems to reduce post-harvest losses to enable farmers to tide over both situations of bumper production leading to a glut and abrupt price fall and incidences of less production resulting in the availability of meagre marketable surplus. Union Agriculture Minister said the approach adopted encompasses both adoptions of cost effective production and diversifying agriculture towards growing of high-value crops, agroforestry, rearing of livestock, poultry, fisheries, etc, as well as creating accessible and efficient markets to ensure better price realisation to the farmers through a robust value supply chain. We empathise with the farmers and for that purpose have formulated farmer welfare centric programs and policies, which is equally related to food security and price security. Singh said in order to address the constraints of present agricultural marketing system promoted by APMCs and assure accessible marketing facilities to farmers, the Government has shared a corrective reform with the States and we have been able to move faster on this front in the last 2-3 years since the circulation of model APMC Act, 2003 to the States. Union Agriculture Minister informed that the model Agriculture Produce and Livestock Marketing (Promotion and Facilitation) Act, 2017 was released to the States on April 24, 2017, and has received a positive response regarding its adoption from all States. Singh said my Ministry is seized with the consolidation of the Mandis integrated by way of total transition to online bidding and payments so that the envisaged benefits reach the farmers and traders both. Radha Mohan Singh said the aim is to bring markets closer to the farms along with appropriate storage, grading and sorting facilities to reduce transportation costs, distress sale as well as the number of intermediaries so that farmers can get a larger share. Singh said an important step that States could take in this regard is the declaration of the warehouses/silos/cold storages, etc as market sub-yards so that the farmers can store surpluses and sell directly without having to transport the produce to the APMC yard. He said the government is in discussion with Warehousing Development and Regulatory Authority (WDRA) on synergy with our programs so that the farmers can also avail pledge financing against the produce stored in scientific WDRA compliant warehouses.